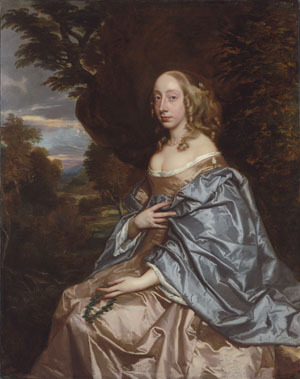 To view portraits by Sir Peter Lely for sale please go to www.philipmould.com. Lely was Sir Anthony Van Dyck’s successor as court artist, and was appointed King’s painter by Charles II. In this work, painted shortly after the Restoration, we see Lely at his best and before he came to rely heavily on studio assistants. Here, the drapery has been painted with great finesse, and one can sense the texture of the fabric as it folds around the sitter. In later works, Lely would often leave such passages to his assistants. The autumnal landscape is also unusually detailed. The background scene is clearly influenced by Van Dyck, as is the composition of placing the sitter in front a rocky background.